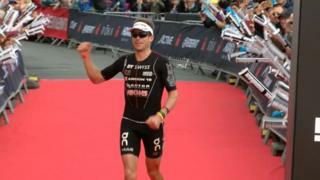 Matt Trautman has completed an Ironman Wales double as the South African claimed a second men's title in Tenby. The 32-year-old was the first of the 2,400 athletes to finish the 140-mile endurance test in Pembrokeshire, which he completed in less than nine hours. Trautman, who first won the event in 2014, finished in eight hours, 53 minutes and 21 seconds. Lucy Gossage, a part-time oncologist from Nottingham, became the women's champion for the third time. The defending women's champion is the first person to have won an Ironman Wales title three times. This year's 2.4-mile (3.86 km) swim, a 112-mile (180.25 km) bike ride and full marathon was the biggest since the event began in 2011. Former Welsh rugby star Shane Williams also competed in the race which has become a regular fixture on the international triathlon calendar and is regarded as one of the toughest on the circuit. The event is said to be worth £3.7m to the Pembrokeshire economy, according to a report, and hotels and guest houses around Tenby are booked up months in advance. Thousands of spectators lined the streets of the popular seaside resort and around the course as competitors swept through Pembrokeshire.